Are you thinking of having a bonfire outside in the yard this summer? How about using firewood indoors to help heat the house during the winter? It turns out that not all woods are the same. Some can smoke too much when they’re being burnt, or have terribly stinky odors. Others can build up creosote in your chimney. In particular, “green” or wet wood isn’t what you want to use when burning fires on your property. So, how do you choose and then store firewood these days? Ideally, you want to find and buy “seasoned” wood. This is wood that has had a chance to dry itself out over time– typically six months to a year. For instance, did you know freshly cut “green” wood may contain up to 45% water? Seasoned wood, however, is more likely in the 20-25% range, and that’s a good thing. 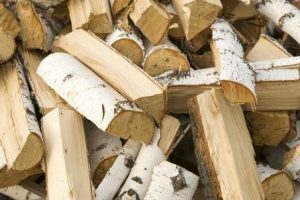 Seasoned firewood burns cleaner, produces more heat, and, since it’s drier, it’s easier to “start.” The less water in your wood, the better off you’ll be. The more “split” up the wood is, the better because that means more surface area has been/can be exposed to sun and wind to season it, letting water escape and evaporate. So what does seasoned wood look and feel like? You should look for wood logs with darkened ends and visible splits and cracks. It should be lightweight to pick up and make a “clunk” sound when two pieces hit each other. Storing wood comes into play because you don’t want to expose your wood to more water– you want it to continue to dry out over time and not rot. Ideally, store wood off the ground in a place where it’ll get some air circulation. If this is outdoors, put the pile in a sunny location and cover it up on drizzly days. Better yet, store it on a covered porch, in a shed, or, if you have to, a part of your garage. Green wood turns into seasoned wood after about six months of storage, and then it’s “good” for fires for about three or four years. One final thought: don’t burn treated or painted wood, tempting as that may be. That kind of wood will end up releasing chemicals that you, your friends and family, pets and neighbors should NOT be inhaling. If you’re in the market for reliable firewood in the Kingwood, TX area, contact Forest Tree Service today.